Bariatric surgery has become a common weight loss procedure to treat people suffering from severe obesity in recent times. However, there are some issues that people should be aware of prior to having the surgery. It is important to be informed about the possible nutritional deficiencies that can occur after the surgery. 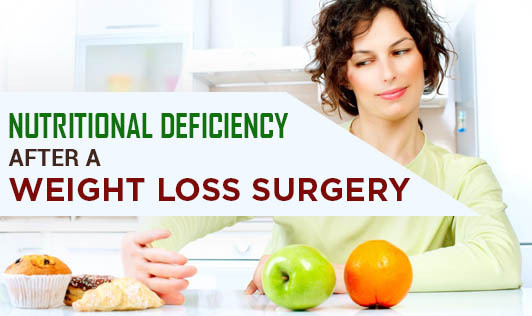 Nutritional deficiency occurs as the major part of the small intestine would be bypassed after the surgery. The small intestine is the area where nutrients are absorbed by the body and is also the place where bile and pancreatic enzymes absorb fat-soluble vitamins from the ingested food. Deficiencies that can occur after the surgery include: Calcium and Vitamin D deficiency, Protein deficiency, Iron deficiency, Vitamin B12 and Folate deficiency, Thiamine (Vitamin B1) deficiency, etc. Obesity has become a serious epidemic with grave health consequences. The health impact can be devastating as there are a number of illnesses that coincide with obesity such as diabetes, lung/ breathing problems, heart disease, immune system problems, circulatory problems, and more. This surgery has now become an effective solution. But, when considering surgery, it is important to consult with your physician to learn about the risks and rewards of having bariatric surgery.